In April 2016, LaDonna Brave Bull Allard established the first resistance camp to the Dakota Access Pipeline on her family’s land along the Cannonball River. By that summer, thousands of self-proclaimed Water Protectors had answered her call to join her and her relatives at Standing Rock. The movement known as #NoDAPL sent shockwaves around the world as Standing Rock became the site of the largest gathering of Native tribes in over a century and a symbol of indigenous resilience and unity worldwide – from the Māori in New Zealand to nomadic tribes in Mongolia. 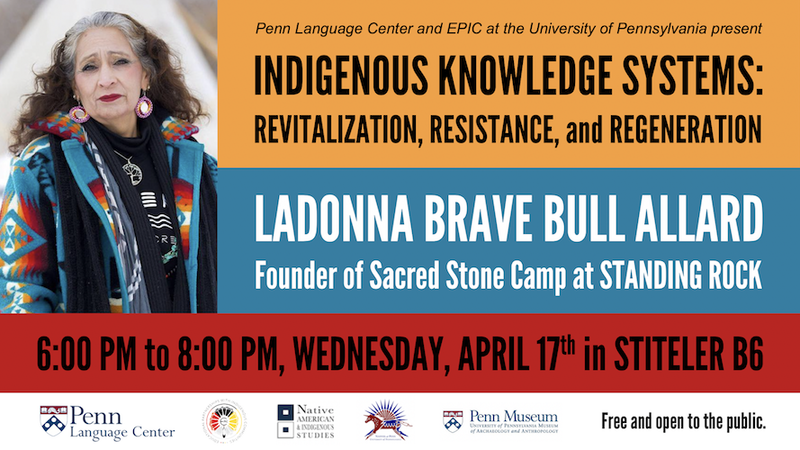 LaDonna Brave Bull Allard, a former Standing Rock Sioux tribal historic preservation officer, will discuss how the revitalization of indigenous languages and knowledge systems informed this movement and continues to empower Native communities and serve as a strategic resource for educational initiatives and regenerative development projects. Opening remarks will be given by Curtis Zunigha, Director of Cultural Resources, Delaware Tribe of Indians in Oklahoma. Mr. Zunigha is the Co-Founder and Co-Director of The Lenape Center, a non-profit corporation based in New York City which promotes the history and culture of the Lenape people (aka Delaware Indians) through the arts, humanities, and social identity. Margaret Bruchac, Assistant Professor of Anthropology and Coordinator of Native American and Indigenous Studies will moderate.